FLOWERS: Very long tubular flower with flared top. The trumpet-flare is only a bit larger than an American dime. Flowers are crepuscular, opening at dusk. Blooming mostly after summer monsoon is well under way; August through November. The long tube makes the flower suitable for pollination by sphinx moths. 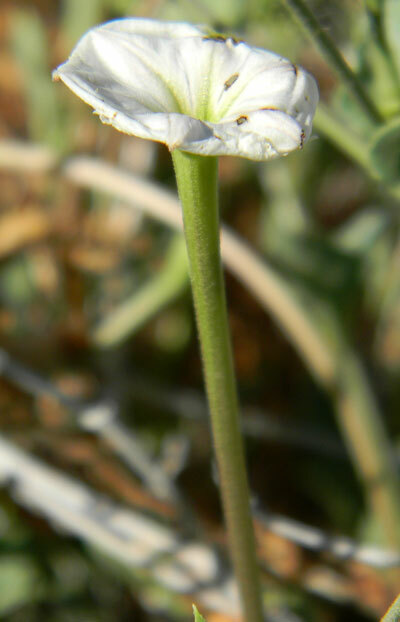 RANGE: Rare plant in the Sonoran Desert. Found only at a few isolated locales. Also found in western Texas and northern Mexico. 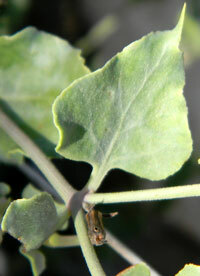 LEAVES: Opposite, dark green, leaves are triangular in shape and appear to have wrinkled margins. The leaves are stiff textured.